I have the Gundam the Origin manga so it was threw me for a loop hearing you say they should remake the first series when the manga starts with Side 7 getting attacked. I guess they really wanted to adapt Char’s past which is basically volume 5 of the manga series I have. Yes, the anime is just Char’s (Casval’s) backstory (with some other backstory thrown in, specially a more compelling portrait of Amuro as a teenager that is more believable). The attack on side 7 is not shown. It’s a prequel to the original. A good one. All fundan I know is anime based (but I have seen pretty much anything set in the U.C.). Are the manga worthwhile? The Origin manga is quite good. Gundam Thunderbolt is pretty enjoyable as well. I finished Planetes yesterday. As promised, this is a great series. It starts off as a slice of life, but morphs into something else, and then morphs into something else. And not many stories can pull that off and not leave the viewer disappointed. It’s done really well. My only real complaint is that there was absolutely no need for Episode 26. Episode 25 was the perfect ending, so I had to debate with myself for a couple of hours if I even wanted to watch one more episode. In the end I chose to, and it didn’t add anything to the series, it only took away, I thought, by being an epilogue that didn’t add anything and diluted my memory of the show a little. Summary: Recommended. But stop after Episode 25. Overlord season 3 has been over for a while, so obviously I’ve been in no rush, but I’m finally watching it and it’s very much the same as the first two seasons. Which is largely good, or else I wouldn’t be bothering. Watching this show reminds me of going through a RPG main quest on easy difficulty - exploring a world with a somewhat ridiculously overpowered set of characters, ranging from one-on-one encounters to impacting the fate of nations. Grit your teeth through the NPC girls fawning over “Lord Ainz”, and the rest is a pretty fun story. I finished Gurren Lagan. Overall it never really transcended its formula to become something special. There was a moment in the middle of the series when the Earth was going to be destroyed by the moon where I felt like the series had a chance to really contemplate important things or to provide more insight into humanity, but they went for the cartoon rah rah rah we can do the impossible even in that situation, and nothing deeper. Oh well. Overall a waste of my time. Not recommended. I think to enjoy Trigger’s works you have to enjoy the animation itself, which is pretty incredible. the stories are serviceable, but mostly a vehicle for going over the top and animating crazy stuff. I still think Kill la Kill is their best work so far. For someone to get halfway through Gurren Lagan and still think they’re watching something that has any interest in being even remotely contemplative or insightful is just… wow. Well Gunbuster did that, in 1/4 the length, so I wouldn’t blame the viewer. Tei watched Zombie Land Saga. He enjoyed it. Speaking of Trigger, I just finished watching Little Witch Academia. I started watching it to see if it’s something my daughter would enjoy, and the first half of the season is mostly gentle Witch-School hijinks, but the second half spirals into more typical Trigger-style excess pretty quickly. It’s well constructed, but the tonal dissonance between the first half and last half means that I don’t really know who it’s for. I more or less expected it, as Kill La Kill spiraled out of control in the last half, but the starting point was more heightened, so it wasn’t quite as bad. Also, IIRC they’ve admitted to making up Kill La Kill as they went along, but LWA had a much more coherent and obviously pre-planned story. I sometimes make a joke that every anime / manga ends up “in space” eventually, sometimes literally going to space, others just representing the kind of power-creep shark-jumping that usually happens because a manga has been running for like 10 years and they run out of places to go. Trigger seems to have internalized that as part of their aesthetic and just go straight there after 13 episodes. LWA only manages to make it into the upper atmosphere / low earth orbit (spoilers: they chase an ICBM on rocket-powered brooms). The thing that stuck out the most is that there are at least 3 episodes where “somebody reads internet comments about their work, and is depressed because of it” is fairly major plot point. So, it’s a thoroughly modern show, I guess. (I like Kill La Kill a lot, and actually think that there’s a core of commentary on modern Japanese society inside it, to the point that I would consider watching it again). I also tried watching Hi-Score Girl, because people talked up the arcade-nostalgia. Unfortunately, I find the animation style incredibly ugly (its a style I think is ok in manga, but very unpleasant in motion), and my anti-pander reflexes started kicking in. My arcade era is slightly later than the one presented in the show (CPS2 4 lyfe! ), so it could just be that the nostalgia isn’t hitting the mark for me. I thought the first half had a really interesting draw. As the humans kept getting victories, we saw some scenes from the King’s side, which implied that the humans getting their victories were actually spelling doom for humanity. That was an interesting hook. Of course, in the end it turned out that eventually, billions of years later, the universe would end, and that’s what stupid anti-spiral people were trying to prevent the whole time. I don’t know, I just thought they’d have something more interesting in mind the whole time. I loved Little Witch Academia. Would love to get more of it. Yeah, to be clear, I actually enjoyed it quite a bit, and watched the whole thing, which doesn’t always happen. I like the magical world they created, and the characters are generally charming. Its just more Trigger-Anime-With-Witches than Anime-The-Worst-Witch, which means it’s probably too old for my daughter for a couple years. Looking at the universal acclaim for that series in the thread, I am really looking forward to whatever day I finally will be able to watch it — there was an offer for a free season on Amazon not long ago, but it locked me out of it, grrr! I can’t even grasp or imagine anyone having a interest in Japan. Because… why?, their entire culture is build around “please no surprises”. Theres more to learn from background radio noise. Thank you for reminding me why I usually just scroll right past your posts. I’m probably the only person in here that didn’t like the LWA TV series. The original one-off episode they made an eternity ago was the best thing about the franchise, but everything after that was a slow, downhill slide in quality by comparison (just like Trigger’s overall output as a studio, but that’s a rant I’m not about to get into). The plot was rather weak given they had 24 episodes to work with, the ensemble was underutilized, nearly all of the drama was contrived, and it just seems clear (to me, at least) that LWA only really works in bite-sized increments rather than a half-year-long run. One of my biggest disappointments of that year. None of that means it was awful, just nowhere near the level of quality I expected given the earlier pair of OVAs. I wouldn’t mark as one of the best ever or anything like that. For me it was more a pure, silly fun sort of thing. 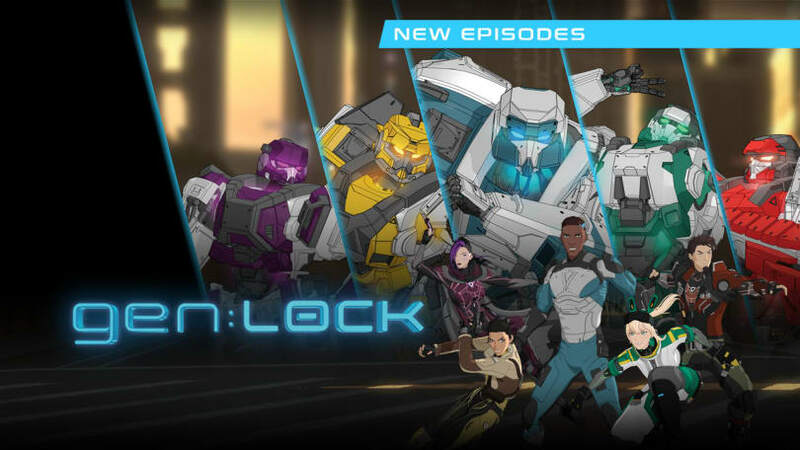 So Rooster Teeth’s first season of Gen:Lock finished up, today. Good show. The first episode promised a more grim series than it wound up being, for better or for worse. Solid animation, nice soundtrack, good voice talent, a little cheesy at times (but generally much more serious than RWBY). Worth a watch, and the first episode is available for free while the rest are currently paywalled behind a $5/month subscription. Here’s the thing; it’s an 8-episode season, so one month’s worth will easily let you get through it all (about 3-4 hours worth of show, overall). Naming a cartoon after a decades-old technique for synchronizing video signals. Bold move.